Dealing with an echoing conference room? It's a pretty simple recipe: high ceilings + hard floor + drywall = acoustical disaster in an office. 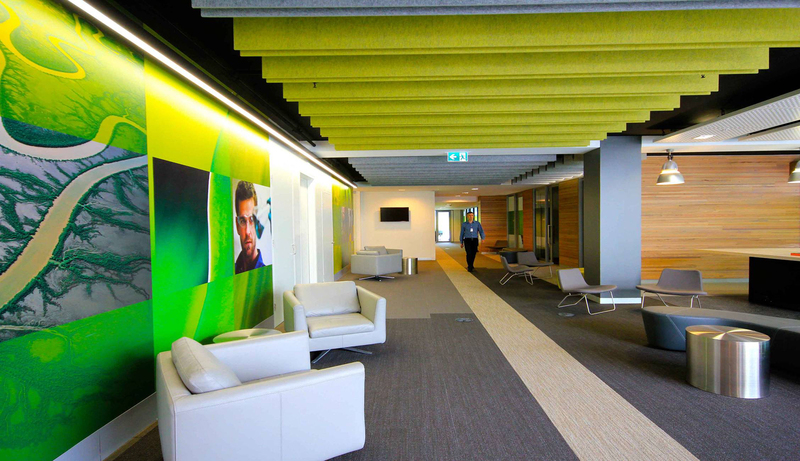 Aesthetically speaking, these types of offices are appealing, providing a clean, sophisticated look. 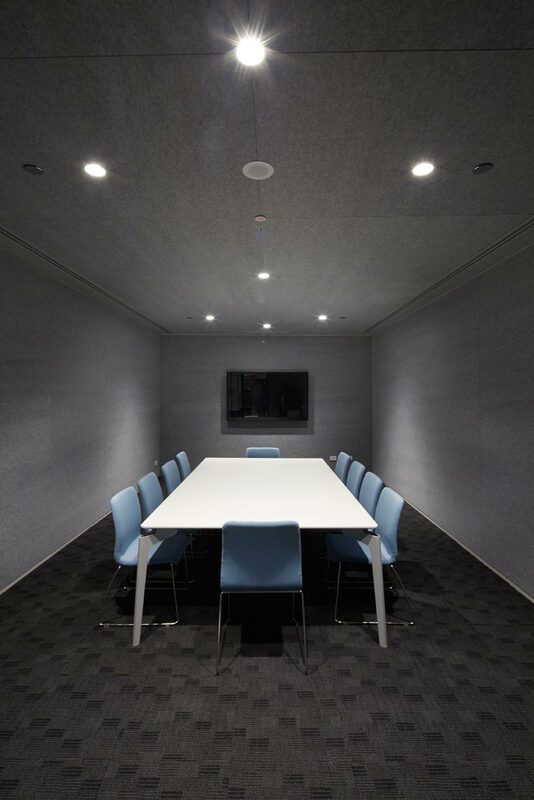 However, if you have ever had a conference call or even a 2- or 3-person meeting in a room like this, you know that echo issues can come to the forefront fast. Even with a small number of voices present, conversation becomes difficult to hear clearly. The sound from the phone speaker or from your colleague's voice reverberates around the room and bounces off of any hard surface – the largest surfaces being the walls. This reflection of sound is known as "flutter echo." Flutter echo happens when two hard and flat surfaces are placed parallel and then sound reflects off both surfaces quickly, with little absorption occurring. This doesn't just happen between two walls – it also can occur between floors and ceilings. So what can you do to remedy this acoustic issue? 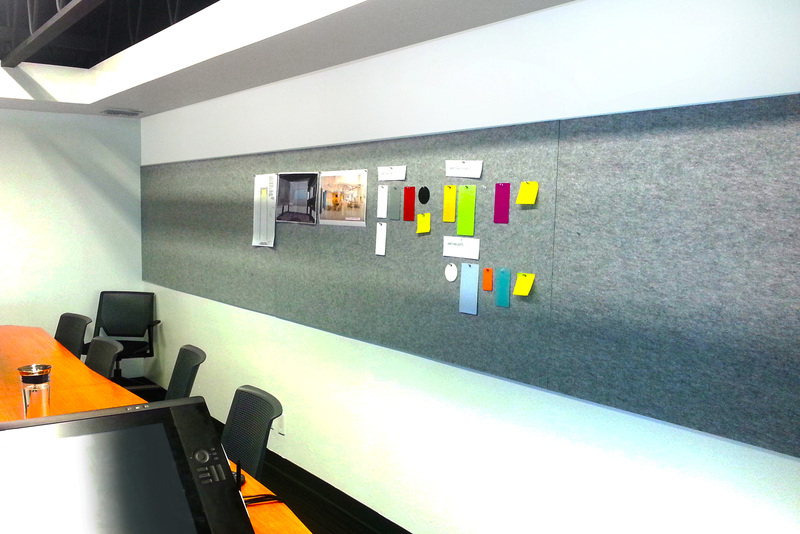 Obviously, introducing sound absorbing materials into the space is crucial...a nonnegotiable, even. Below are some ways to do just that in a creative and visually appealing way. 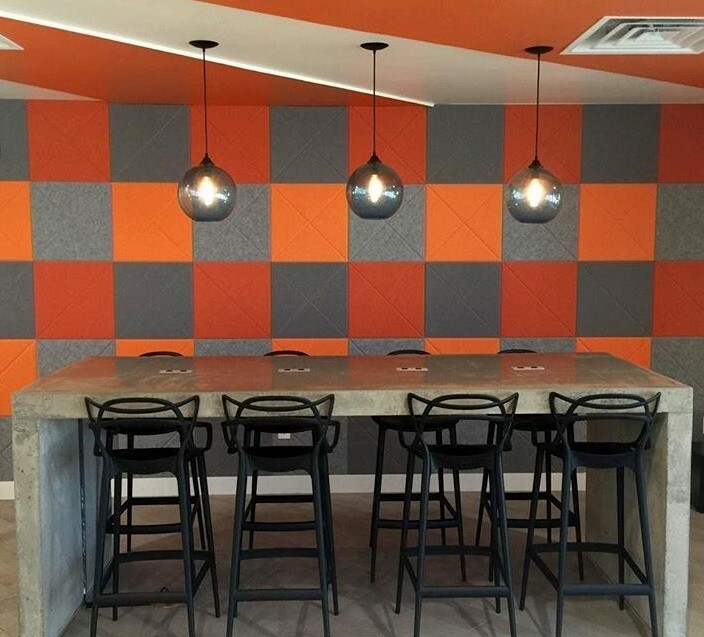 You don't have to sacrifice the cool factor to have better acoustics in your work space. Typically easy to install and often times made from renewable materials (like these! 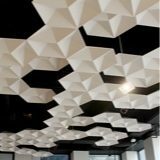 ), acoustic tiles can add some serious design elements to your office while helping buffer all that sound and echo bouncing around the walls. 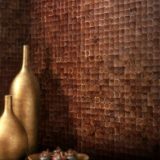 With a wide variety of colors and shapes, tiles can either cover an entire wall or various portions of each wall. TIP: Keep in mind that, if used on parallel walls in sections, it is best to not put the tiles directly across from each other. Stagger the tile sections across the walls, so that if sound is bounced off of a hard, bare part of the wall, it will directly reflect into an absorbing material. 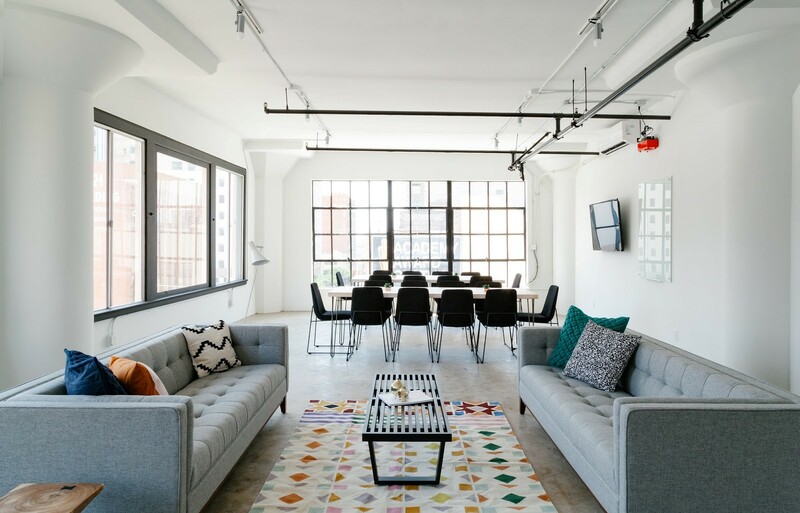 Create a warm, inviting feel by rolling out a decorative rug over the hardwood or concrete floors within an office to add a stylish absorbing material in the room. While this suggestion is not a fix-all to the acoustic problems within a room, it will definitely help with the sound reflecting from the high ceiling onto the ground. Think of this as an acoustic chandelier of sorts. Though not as flashy, hanging baffle racks can come in quite a range of different styles and can even be worked around lighting (though we recommend getting an expert involved before rigging up your own baffle lighting system).By simply adding a hanging acoustic system above your desk or in the center of the room (while taking into consideration the space's size), you can greatly improve the acoustics of the office by decreasing volume levels and absorbing more noise. 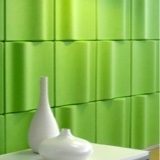 Similar to the idea of tiles, acoustic panels can absorb sound while covering a larger range of surface area on a wall. 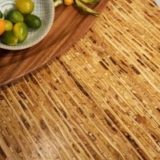 Many people line an entire wall with panels, and since there is such a wide range of color and pattern options, along with ways to print photographs directly to panel material, the design options are endless. TIP: To avoid only solving half of the problem when installing panels, try to make sure that the walls adjacent to each other, rather than the parallel walls, are covered with the panels. In doing this, you guarantee that even if sound is reflected off of a hard wall, there is an absorptive surface waiting for it. Acoustical issues are often thought of after the design and construction of an office takes place, rather than before. However, acoustics are just as important as lighting and the layout of an office. By taking these tips and working them into your space, you can solve your echo issues in no time.